The owner of the Supermac's fast food chain is to create 300 jobs, with the opening of new outlets and the redevelopment of three hotels his company has taken over. Pat McDonagh and his wife Una announced the plans this morning in Co Laois, where a new regional enterprise plan for the midlands was also launched in a separate development. 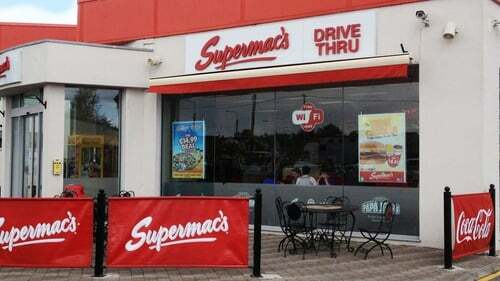 The Supermac's founder announced the creation of 200 jobs with the opening of new fast food outlets in Wexford, Waterford and Kinnegad in Co Westmeath. A further 100 jobs will be created through redevelopment of hotels, the Athlone Springs, the Killeshin in Portlaoise and the Castle Oaks in Limerick, which were bought just before Christmas. Supermac's has also gone to planning for new plaza developments in Letterkenny, Longford, Ennis and Portlaoise with the promise of 300 more jobs down the line. Mr McDonagh has said that there is a lot of opportunity in towns around the country. Speaking on RTÉ's News at One, he said 75-80% of the new 300 jobs will be full-time roles. He said it is important the jobs are spread across the country because there are areas that have been neglected over the last number of years. However, he added that "the towns themselves, and the people in the towns, have to stand up and be counted and do something for themselves". Mr McDonagh also said that hoteliers and restaurateurs have to constantly improve their offering in order to attract more customers. The jobs announcement has been welcomed by Minister for Enterprise Heather Humphreys who launched the first of eight new regional enterprise plans for the regions in Co Laois this morning.